Fox has been manufacturing differential pressure venturi flowmeters for industrial, oil & gas, aerospace and research applications since 1961. Fox venturi meters are precision machined to meet customer requirements, with fast deliveries, superb quality, accurate flow calibrations, and with whatever quality documents are, or are not, necessary for your application. 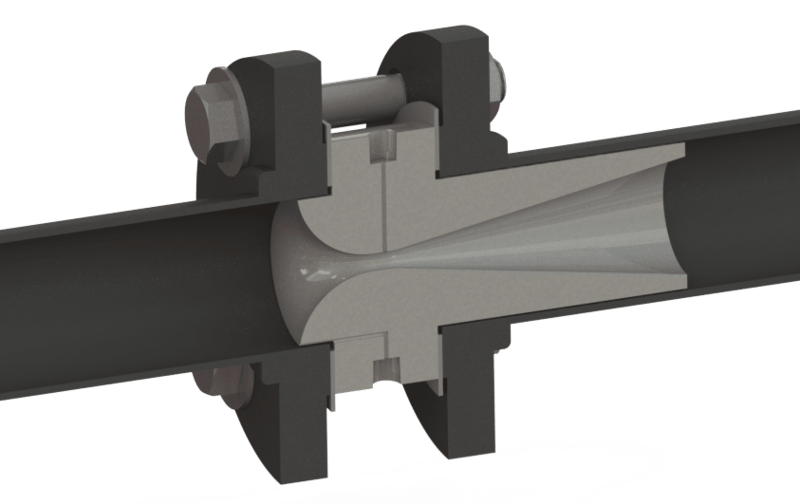 Customers can specify a required flow range, a maximum inlet-to-throat measured delta-P, or a specified throat diameter. End connections can be any thread, any flange, or any weld connection used by industry anywhere – inches or metric. Fox venturi flow meters are often specified when overall pressure drop must be minimized. Unrecoverable pressure loss is typically about 10% of measured differential pressure, and since this inlet-to-throat DP at max flow can be specified to be as little as 25” WC (inches of water) or 50” WC or 2 psid – resulting pressure loss can be minimized to 2.5” WC or 5” WC or 0.2 psi. Shown above is a typical flanged differential pressure venturi flowmeter, this contains an integral inlet pipe section with inlet pressure tap. Any commercially available flanges, threads, or weld-prep ends can be specified. This includes: ANSI Flanges – 150# to 2500#, DIN (Metric,) Naval. Fox flange-insert style DP venturi flowmeters can be inserted into flanged piping systems but are manufactured with no welding. This is an ideal solution to reduce costs and when fast deliveries of venturi flowmeters are required. They are especially attractive when weld inspections or other QA requirements would add significant cost to a welded flanged assembly. This Fox differential pressure venturi flowmeter includes AN ends for use with 37° flared tubing in an aerospace application. Any threaded end can be specified – such as NPT, BSP, AN, SAE. Fox can also weld on any commercially available tube or pipe fitting to facilitate installation in your process system. Fox Venturi Flow meters for Cryogenic/ Low Temperature liquids & gases: Liquid helium, liquid hydrogen, liquid oxygen, etc. Please request what you need!